Roll each roll into a 6-inch rope. Place butter and cheese in shallow bowls. Dip each rope into butter and then into Parmesan cheese. Place breadsticks on an 11×17-inch sprayed baking sheet in 2 rows of nine each. Sprinkle with garlic salt, if desired. Cover with plastic wrap. Let rise until double in size. Remove wrap and bake at 350 degrees F 15-20 minutes or until golden brown. tHE INGREDIENTS CALL FOR 24 ROLLS MADE INTO 6 INCH ROPES, AND THE DIRECTIONS SAY TO PUT THE ROPES INTO 2 ROWS OF 9 ON THE BAKING SHEET. What happens to the other 6 rolls? sHOULD THE 2 ROLLS OF 9 BE 2 ROWS OF 12? will 12 fit on a baking sheet or do I need another sheet? Michelle, We made a mistake in this recipe. Thank you so much for catching it. The recipe should be for 18 Yeast dinner rolls (or 36 if you want to use the whole package and two baking sheets). Let us know how these turn out for you! Personally, they are my favorite recipe on the website! I think the number of servings is still off. My caps lock is not on either, maybe your website only accepts caps? anyway, these are really great breadsticks. Yes, we just changed that to 18 servings! Thanks for noticing! Most of the recipes shown in the recipe article look and sound delicious. My only problem is that almost all of them contain wheat or breading. My husband is gluten intolerant and therefor cannot eat any wheat, rye, nor barley. I would ask if there are recipes that could be shared that do not have bread or bread-containing ingredients in them. Some pastas are fine as there are a number of companies that sell alternative pastas that are able to be directly substituted for usual pastas.. Bread and bread-containing ingredients are harder as you have to alter the amounts of certain types of alternative flours you use to get a 1:1 substitution. I personally get too confused trying to figure out what flour combination in what ratios are good substitutes for which kind of bread stuff you’re trying to make. Thank you for your comment but we are a frozen Bread Dough company. So all of our recipes use our products and they do contain gluten. So I am not able to help you substitutions. Sorry! 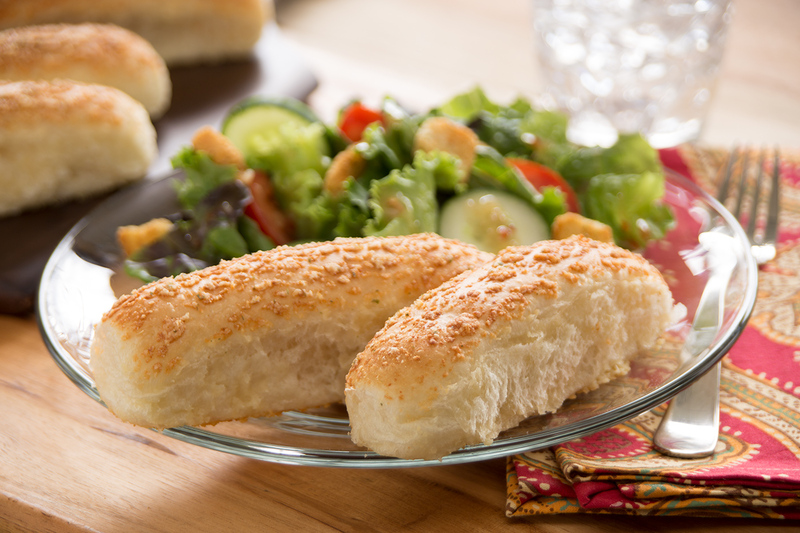 You certainly could use our pizza dough to make the Buttery Breadsticks! Certainly you can use the pizza dough to make the Buttery Breadsticks! Enjoy! hOW FAR APART SHOULD BREAD STICKS BE TO HAVE THEM NOT TOUCH WHEN BAKING? iS THAT IMPLIED IN THE SPACING OF QUANTITIES LISTED ON THAT SIZE OF BAKING SHEET? If the breadstick were a few inches apart from each other, they should not touch each other while rising and baking. Thanks for baking with Rhodes. These were DELICIOUS! I followed the recipe adding the garlic salt and sprinkled the BREAD STICKS with a bit of parsley flakes. I will use this recipe whenever I want to make bread sticks! thank you!